Sometimes I looked through my past works and wondered what inspired me to draw that or favour a certain style during that time. Other times, I have the urge to remove the 'uglier' works from my website but thought a better way would be to leave them as they are and create another version. Here's another re-work on my earlier piece titled, 'One-winged angel'. I was torn between keeping it in simple black & white or giving it a full colour since both will have a very different feel. Perhaps I'll try both! Ha. 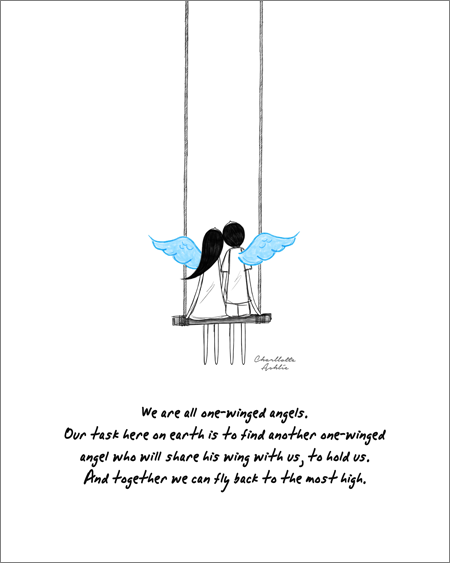 ''We are all one-winged angels. Art print and other merchandise available here >> Shop.